"You can't just go killing someone else's god." The third disc in the Neo Ranga series delivers another eight mini-episodes, closing off the first season of the show. After the initial upset having their very own god created, life with Ranga has settled down, and the three Shimabara sisters have pretty much accepted their positions as its kings. As the disc opens, the girls are trying to enjoy some vacation time on the island of Kyushu, where the locals have a festival honoring Ranga planned. However, their aunt and uncle, who they haven't seen in ages, aren't very happy with the girls' arrival, as they are still bitter about their mother's offense to Lord Reiya, the god they are now sole guardians of, and whose sacred temple they oversee. When Yuuhi decides she's had enough snubbing, she sets off with Ranga to destroy the shrine, awakening its god in the process. Back at home in Tokyo, while the citizens see him as a saviour, there is a growing resentment of Ranga among political circles and the military, and plots are hatching to do something about the uninvited giant now living in their midst. After setting up a smear campaign that paints Ranga as more a devil than a god, a new joint edict from both the Japanese and U.S. governments puts Ranga between a rock and a hard place, making him unwelcome in either country. Meanwhile, plans are in the works to kidnap Ranga, while the military decide it's time for a showdown with their ASE weapon. Neo Ranga continues to entertain, with an intriguing mix of tone and content. As the series closes, we also get more introspection from the Shimabara girls, as they come to understand the roles they play, which gives a bit of depth to their characters. The complexity of the unusual premise is handled well, combining ancient mysticism and culture with modern political subplots and maneuvering. Humor is still abundant throughout, with several laugh out loud moments between the three very different personalities in our principles. The pacing continues to be somewhat erratic, but in a good way, lingering in places, then picking right up with the action again, and the twelve minute format keeps moving things along briskly, with little time for filler. There is a bit less continuity episode to episode on these final installments, as things don't quite pick up where they left off before from show to show. The first season is quite fun, so it will be interesting to see where the setup leads as we move forward. Image Transfer Review: Image quality is very good, with strong, solid colors, although black levels seem a little light in a few places. There is a bit of bleeding at times, and some murkiness in darker colors, but nothing extreme. There is a bit of aliasing and slight blockiness at times, but cross-coloration was nonexistent. Audio Transfer Review: Japanese and English dub tracks are available. Stereo audio is well presented, with a nice soundstage, featuring good directionality and depth. Dialogue is clean and easily discernable. Extras Review: Another collection of production sketches is included, presented as a slideshow set to the show's opening and closing theme music. Clean opening and closing credits are present, along with more translator's notes, explaining some of the cultural content. 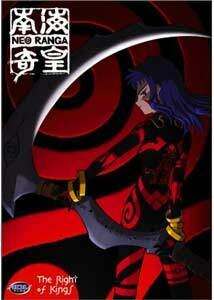 A Neo Ranga trailer along with previews for Martian Successor Nadesico: Prince of Darkness, Najica Blitz Tactics, You're Under Arrest: The Movie, Steel Angel Kurumi 2, Farscape Season 2 andSouthern Cross round out the on-disc extras. A foldout map of the Musashino Ginza area is included as an insert, showing where many of the people and places seen in the show are located in relation to the Shimabara household and each other, with production sketches and some brief notes about some of them. Once again the cover is reversable, with a more revealing image of Yuuhi on the reverse. Neo Ranga is a fun and interesting little series, with a lot of things going for it, including the mini-episode format which keeps things fairly tight. The characters are likeable, and good for a lot of laughs, while the storyline build in complexity from an already unusual premise. Ranga itself is an intriguing creature, as is the background of the Shimabara girls as the story unfolds. ADV's handling of the packaging is also encouraging, and while not overloaded with extras, still packs a decent supplement set. Recommended.